During a recent client visit, the “Service Required” message flashed on the dash of a 2010 Range Rover HSE. I have seen this message frequently and recommend at least an oil change ASAP. Land Rover has programmed your Range Rover to flash this message for only 4 seconds at each ignition cycle. I guess you really need to pay attention or you may miss this important message. In my opinion, Land Rover could do a better job communicating of when your Range Rover Service Required message comes on and how long the message has been active. I have read the owner’s manual and found a few very short paragraph on this topic. Check out this image. Land Rover provides within these paragraphs short and vague service information. “The service interval message will appear when a pre-determined distance or time before service is reached.” Really. What happen to straight to the point recommended service intervals? I guess a basic time and mileage counter is too simple and boring. Land Rover has expanded service information with the Passport to Service booklet included with your owner’s manual. Let’s see if Land Rover can be provide some more clear information for your Range Rover Service Required message. Check out this picture directly from your 2010 Range Rover Passport to Service Booklet. Finally we can see some mileage number and time intervals for recommended service. Great, but what is this note in the black box on the top??? Let’s investigate. “Should the vehicle have a high proportion of short journeys or operate in severe conditions, Land Rover North America, Inc., recommends that the maintenance intervals be cut in half.” Land Rover you were doing so well with this detailed maintenance schedule until this vague statement about short journeys. What is a short journey? 2 miles of driving? Or 20 mins of bumper to bumper traffic? Help us out here. We care about our Land Rovers. Us Land Rover owners want to protect our investment. Please provide some clarification to short journeys and severe conditions. I guess us Land Rover owners could just assume we need to service our Land Rovers at 7,500 miles and not 15,000 miles. Done, very simple solution. Ok now lets go back to the “Service Required” message that flashes at start up. Our owner’s manual provides some vague paragraphs and the Passport to Service completely skips over the “Service Required” message. I did a little more research and found some more information within the Land Rover workshop manual. Within the workshop manual, I found a section called “Information and Message Center- Description and Operation”. This section outlines all technical information related to all information displayed on the instrument cluster. At the very end of this section, a few paragraphs cover the service interval indicator. I have included the information in a image below. 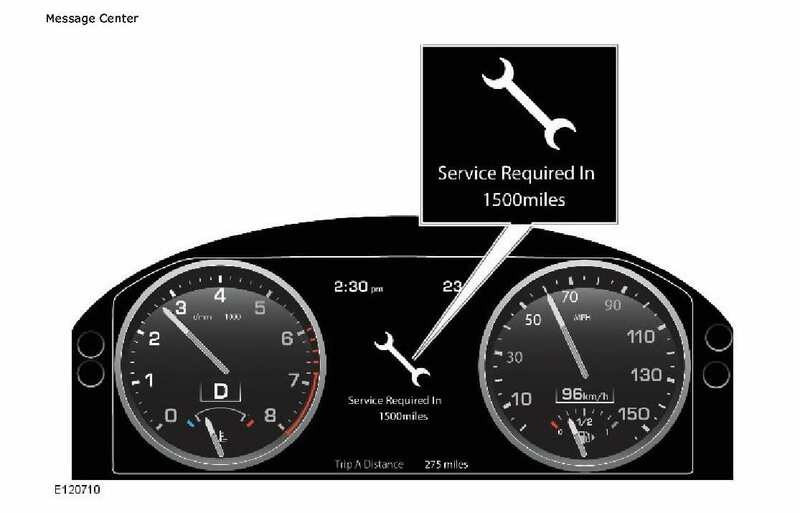 According to the Land Rover workshop manual for a 2010 Range Rover HSE, the “Service Required” message is displayed when your Range Rover needs service. These recommendations are made by mileage and time calculations from the Engine Control Module. Your Range Rover’s Engine Control Module monitors fuel usage to estimate engine oil wear. The biggest change over previous Range Rovers is the lack of a minus figure if service distance is exceeded. Not an issue if serviced regularly. If service distance is exceeded, you really won’t know by how far in distance or time unless you keep paper copies of your previous service invoices.